It is hard to imagine that in this day and age, that there are children in families where even a basic Christmas will not be happening, and at no fault of the parent and certainly not the child, all for a very wide number of reasons. Social security issues, fleeing domestic abuse, fire, burglary, ill heath and sheer poverty are all reasons why families might find themselves unable to buy presents in the run up to Christmas. Can you even start to imagine how that must feel? 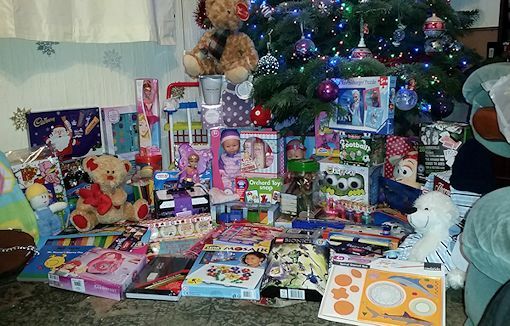 This is why SUPERKIDS have their CHRISTMAS TOY BOX APPEAL. Every year we get to hear about a growing number of children and families in these circumstances, and every year we need more and more new presents to bag up and send out to every child/ young person aged from 1-18. We also want to help vulnerable care leavers, these are the ones 18-25 that no longer have family network and have possibly been in care for many years. These youngsters maybe your children, your neighbours, a friends child, but whoever they will be living in your area. These are children who will not be having presents unless we hear about them. Remember, Christmas Day is THE most important date in any youngsters diary. Fundraising is critical for our TOY BOX APPEAL We ask for donations in kind or in money, and we appeal to the general public and local business's who are so very generous and donate some wonderful presents. We have a number of drop off points and hopefully this year will add a few more where people can drop off an unwrapped gift or collect a number of them and then drop them off. The numbers have risen significantly and Christmas 2015 saw us handing out 1375 bags. This is a bag of presents carefully selected as age appropriate and based on each youngsters interests. Not easy when you need an average of 14,000 presents that need to be bought, collected from drop off, sorted into categories, and then bagged. In 2016 we gave out 1301 sacks of presents, and 2017 saw us give out a huge 1476 sacks. So please if you could help in any way, either donate through our just giving page by using the guidelines on how to donate, or buy that extra present and pop it into one of our drop off centres listed on our appeals page.